When I try and describe my intuitive experiences and communications with animals to others, I often see them smile and nod and I can tell that they are thinking that is nice and maybe even pretty cool, but I so miss the boat in being able to full describe how incredibly amazing that connection feels. Our English language is so lacking. And, perhaps my own verbal prowess is limited as well. I wish I were a poet who is much better at capturing the perfect words to bring about the emotion and feelings of an experience. There is another reason why we often have a challenge describing intuitive experiences. I believe that these intuitive hits we receive occur in a part of our brain where it isn't connected or fully connected to our verbal center of our brain. When a new intuitive skill is opening up to me, I often can "feel" the experience but putting it into words is impossible. I just know it is there and happened. It can take multiple times of having similar intuitive hits before that pathway is created, or perhaps I will read or listen to someone else describe their own intuitive occurrence and it will resonate with my experience and I'll have an "Aha!" moment. Thanks to these individuals that have shared their own observations and intuitive episodes, I have been provided verbal insights to describe my experiences. Because we often don't have the words for an experience, we humans tend to discount the event as something not real or think of it as less important and valuable if we can't describe it readily. Think about how limiting and lacking our language is. Take the word "Love" for example. How many definitions of love is there? I did a Google search of chocolate chip cookie recipes and it came up with 7,290,000 hits! We could probably come up with at least that and more for the the various meanings of love. Just because we may not have the language to fully describe connecting intuitively with animals doesn't mean that the experience isn't incredibly valuable and even life altering. It teaches us so many skills that go beyond being able to connect and bond more deeply with our animals. It teaches us to listen and trust an inner voice that we have learned to discount and ignore because we haven't had the language to explain it. 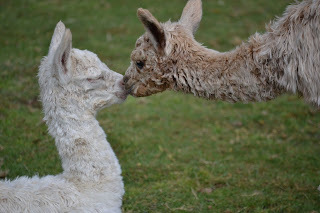 My alpaca males are my sweetie boys until they aren't. I love my boys but they can be pains in the derriere at times too. They can get into some knock down, drag-out fights. I hate when they do that. It causes such a ruckus and you never know if someone is going to come up with a bloodied ear or worse. If I am outside with them, I try and stop it before it gets started. Often if I can catch it before the fight gets going, I can stop it, but once the males really get mad, they are so focused, it isn't even safe to be in the pasture with them. They aren't aware or see anyone else other than that other male they are mad at. One day I was outside with them when a big fight started and I thought, I'm going to try putting out an energy and frequency of the emotions 'peace and calm'. I kept picturing those words in my head and with every exhale, I'd say to myself those words, "Peace and calm." I stood outside the boys' pasture and just kept picturing that energy floating through their pasture. It took just a few moments and they stopped and looked around as if awakening from a daze. Their mouths were open with the spitty mouth look. The boys stood next to each other panting but the fighting stopped. I repeated my Peace and Calm mantra a few more times and things remained quiet so I walked away keeping an eye on the boys to see if they'd start up their fight again. They did not and they each went their own way to remedy their spitty mouth situations. I wondered if this was a fluke or if my peace and calm mantra really worked. I've since had many times to practice it and I have to say, 90% of the time, the boys have stopped fighting. I'd be interested if others tried the same thing to see if they have similar results. Just click here contact and let me know what you observe. If you'd like to learn some other helpful intuitive communication techniques, check out my book, 5 Steps to Animal Communication, it's free just click on the website and fill out the form and you'll get the link to download it. I didn't start off as an intuitive or animal communicator in life. I think I may have been always an exceptional listener from a very young age, but I didn't realize I had a gift for energy work and intuitive animal communication until well into my adulthood. It was during the time I was earning my Master's Degree at Pacifica Graduate Institute that my interest and abilities to communicate with animals appeared. I think many people have the belief that we are born with this intuitive gift. Perhaps we are but many of us don't become aware of it until our adulthood. I'm one of those that didn't become aware of my intuitive abilities until my late thirties. Once I became aware that I had this intuitive ability, I wanted to learn more and always would think to myself, I wish I could become better at this. It is so amazing to connect to someone intuitively especially an animal. 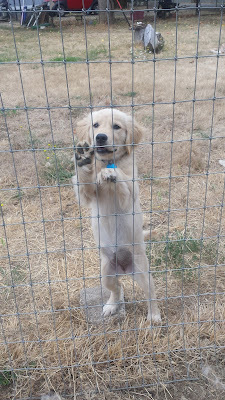 My heart always wants to burst because it becomes so full of amazing energy after connecting with an animal at this level. It is my "high." I've learned several intuitive healing modalities such as Reiki, Healing Touch for Animals, and Emotion Code to name a few. I use some of the techniques I've learned from these modalities but mostly what they have done for me is help me define my own language and way of working with animals. Energy is energy, however, the language we find that fits us individually is always the challenge in interpreting the intuitive information being downloaded to us. I love being able to connect to animals and help their owners understand them better, and help the animals themselves with physical and emotional issues they may have. But I also love the ability to teach others to have these same experiences for themselves. 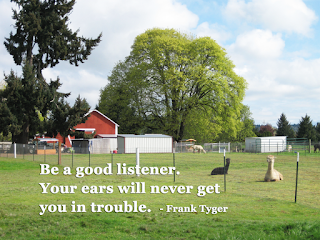 I believe others can listen to their animals as well. The techniques I use can be easily taught to others. It is another way for me to share my love of alpacas and my mission in life to encourage people to listen to their animals in a such a respectful, heartfelt and lovely way. If you can't make it to one of my classes, I have written a book, 5 Steps To Animal Communication that describes how to do some of these techniques and exercises to practice on your own. The e-version is FREE for a limited time. 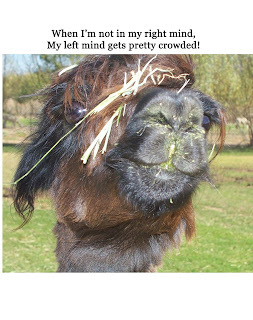 As I began my raking chores this morning, one of my alpacas, Jamilah, started to sneeze. She sneezed repeatedly so many times that I went back into her pasture to see if she was okay. I didn't see anything like a bee sting which would cause her nose to swell and close off her airway. Her nose looked fine except she kept sneezing as soon as I walked away. I kept an eye on her and began raking up the alpaca beans, and she kept sneezing. I stopped raking to check on Jamilah a second time. She and I have always had a special connection and I started to get a little concerned that something was really stuck up in her nose that she kept sneezing like she was. I looked at her again but couldn't find any swelling or sign of something to indicate something really serious was going on. Fortunately, I can do energy work and communicate with animals, so I asked Jamilah if I could help her with the sneezing. I released several energy blocks and her sneezing stopped. I kept receiving information from Jamilah that a bug flew up her nose and she inhaled it. As I tapped into her, my nose started to itch terribly and tickle. I thought how miserable that is for an animal who would have a hard time scratching their nose. I was able to rub mine to make it feel better. But for poor Jamilah, the only thing she could do was try and sneeze. I can honestly say I've had a bug fly up my hose before and it is a terrible feeling! I sent her more calming energy and she laid down for a bit as the sneezing eased off. She had a few more snorts as I raked but they got better. I had the children's song running through my head for the rest of my chores, "I know an old lady who swallowed a fly. I don't know why she swallowed a fly. Perhaps she'll die." The song isn't a perfect fit since it went up her nose instead of swallowing it but that is what came to mind and got stuck. And now I bet it is stuck in yours! Farm life! However, seriously speaking, I am sure grateful for the gift of being able to do some energy work on my animals. I am glad I know these techniques that can ease some of their discomforts. What is also nice, is that my animals now know to come to me when they need a little help. Jamilah is one of the first ones that if she needs a little energy, she walks over to me and stands waiting for me to do my thing for her. Jamilah usually stands in front of me blocking my way and then turns her body to the place she wants the energy. She is quite clear about where she wants her energy directed. What is also nice is that it doesn't usually take long at all to stop and give them a few moments of time and energy and they are happy. And I am rewarded with a closer connection to my animals and I too benefit from the energy. It is all a win/win. If you'd like to learn more how to communicate and work with your animals in an intuitive fashion, after all one of your animals may sniff up a bug, check out my new book, 5 Steps To Animal Communication. I'm offering it for free for a limited time still! 5 Steps to Animal Communication e-Book is now available! 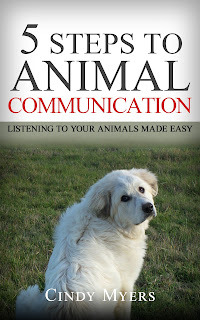 After many people have requested I write a book on how to communicate with animals, I listened! My new e-book is now available for download. 5 Steps to Animal Communication: Listening to Your Animals Made Easy provides easy to learn techniques and exercises to practice and guide you to opening up to your own intuitive abilities. The book is free for download from my website www.BeAnAnimalListener.com. Just fill out the form and an email will be sent with a link to download the book. It will be available for a limited time for free and then it will be available on Amazon. I hope folks enjoy it and get much use out of it. I know these techniques have allowed me to have such a deep and intimate connection with animals and it has been wonderful guiding clients and workshop attendees to having the same experience. I can't wait to hear stories from people and their experiences using these techniques! Tomorrow Tesla goes to our veterinarian to get spayed. She is 14 months old and after going through one heat cycle and doing a lot of research, I've made the decision to proceed with the procedure. I am not a dog breeder so I know it is the responsible dog owner thing to do. Yet, I feel terrible about removing important parts that aren't broken. As we get closer to her surgery time, I feel my stress increasing and that dog owner mom in me worries when she is out of my sight and I must entrust her care in someone else's hands even though I have total trust and respect for our vet. When my animals are sick or needing care, it becomes harder to do my intuitive energy work on them. Stress and intuitive work are counter to each other. Despite years of working intuitively with animals, helping many, many animals with various issues, I find helping my own is so much harder than helping other people's animals. I have that close heart connection to them since they are my kids. My worry and other life issues interfere with me being able to focus and do energy work on them. My animals pick up my worry and often try helping ME instead of ME helping THEM! That makes me feel worse of course! Having someone else that has intuitive abilities or asking for others to help send energy to my animals is important because there are times when even the expert needs help. However, I work hard to park my issues aside during the critical periods when my animals need my skills as an intuitive energy worker. It means me having to do a lot of deep breaths to clear my own stress and issues aside so I can focus sending energy to them. Forcing myself to stay focused is the hardest thing I do at these times because a big part of me just wants to freak. Yet if this gift that has been given to me and that I have spent years honing can't be used when my animals need it, then I'd feel pretty cruddy about that too. So I remind myself to breath, picture that white light going to my animal in need and stay focused. There is time after the energy is no longer needed that I can have a good cry and meltdown. As I coach people learning to communicate and do energy work with their animals, there are times when it is quite ok and terrific to have an expert you can call upon and have them help you during those moments when it is just too hard to separate yourself from your emotions and the needs of your animals. Our love for them is so deep and so connected that it is really hard to do. You would think connecting to our own animals is easier, yet I tell people all the time, go practice with other animals because it is truly easier to learn on other animals besides our own. 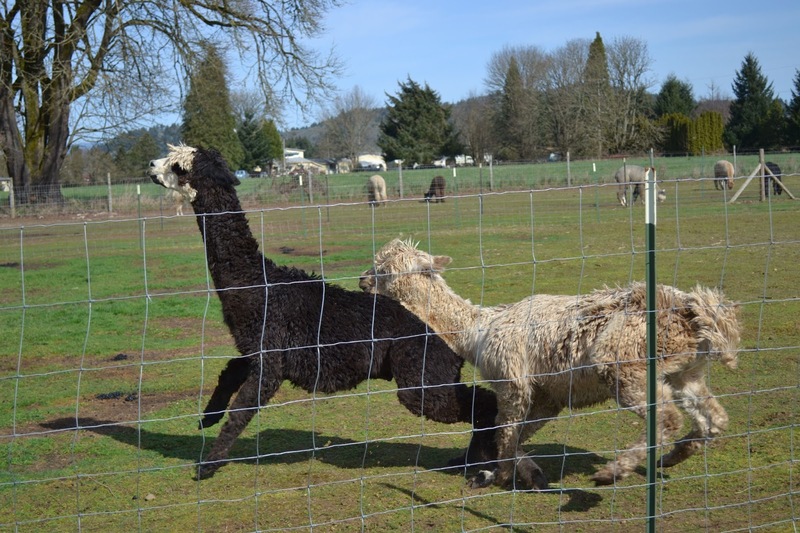 I often offer my alpacas to new learners because they are easy to tap into and work with intuitively. Our animals listen to our subconscious chatter all the time so they tune us out for their own sanity. So finding other animals and supporting other people's animals is a really great way to learn and build your confidence. So tomorrow morning, if you feel like sending Tesla a little healing energy to aid her in breezing through her spay procedure, she and I would appreciate the extra light and energy given her. I have a 13-month old Golden Retriever, Tesla. I am having a blast training her. One method I use to help me get her solid in a new behavior is to reinforce that behavior right before she gets her meal. That is the biggest reward and for her to associate these new or old behaviors with her meal, gets her to do them more successful at other times. That Pavlovian response works well! If I ask her to sit, down, or spin left or right, she associates it with her tasty breakfast or dinner. 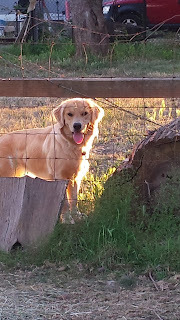 This morning, I was working with Tesla to do her "backup" and "sit/stay" behavior. She did those very quickly and as I entered her pen that I feed her in, I placed the bowl down. 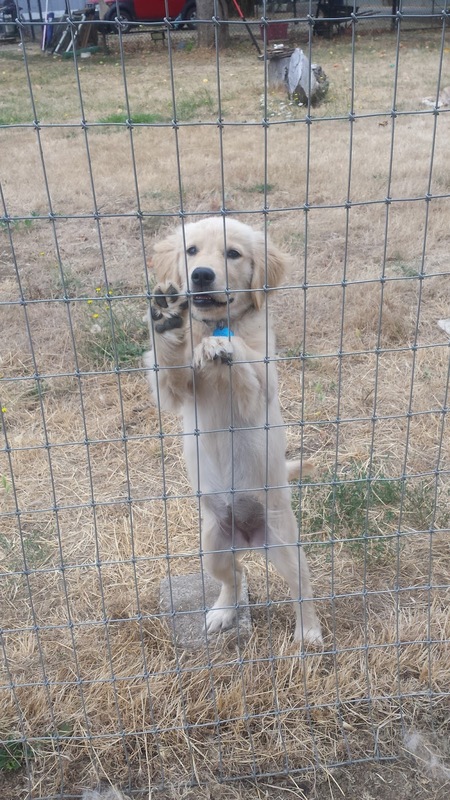 I was going to have her wait outside the pen as I stepped out of the pen leaving her bowl all by itself until I gave her the release command and then she could go get her meal. But before I did that, I asked her to do her best trick which is to "show me your best side." She swings her head to the right when I ask her that. It is so cute! She does that trick without me asking inside the pen when she is waiting for me to give her permission to eat. She goes through her entire repertoire hoping one of them will be the magic word to tell her it is ok to dine! Today, I was adding more complexity and changing the location of where I was asking her to do this trick. She looked at me confused because she doesn't do that trick outside the pen! I waited a moment to see if Tesla would do the trick but she still sat there confused. I asked again with the same result and I said, "Come on, you know how to show me your best side." When I said that, she popped up and came towards the pen. I stopped her because I hadn't released her and made her go back. I asked again and she did her head swing to the side and I then released her quickly and rewarded her with her meal. As I walked away from the pen, I recalled the words I had said when Tesla popped up out of her sit/stay and realized, I DID release her. I said "Come!" She didn't understand the entire sentence but she did hear and respond correctly to the word "Come." That was such a great lesson for me. Choosing our words carefully when we train is so important. It is also important when we do intuitive energy work as well as all aspects of our lives. Learning to listen to our own words and how we use them is as important as listening to others. If our animals are not behaving or learning the appropriate behavior we are trying to teach them, are we looking at our own words, our body language, our emotions? Our animals are listening to us. They listen to us way better than we do to them. Today was a great reminder to do the check-in on myself and realized, I was the one responsible for Tesla not doing what I meant her to do. She did exactly what I said. What a good girl and thanks for teaching me something I already knew but needed the reminder!! !